Le président de l’Olympique Lyonnais a été reçu ce lundi en fin d’après-midi au Palais de l’Élysée à Paris où le Président de la République Française, François Hollande, lui a remis les insignes d'Officier de la Légion d'Honneur. Jean-Michel Aulas has already been honoured several times in the last few years in recognition of his entrepreneurial career as the head of CEGID and of Olympique Lyonnais. The President of Olympique Lyonnais was made Knight of the National Order of Merit in 1985 and then an Officer of the National Order of Merit in 2012. 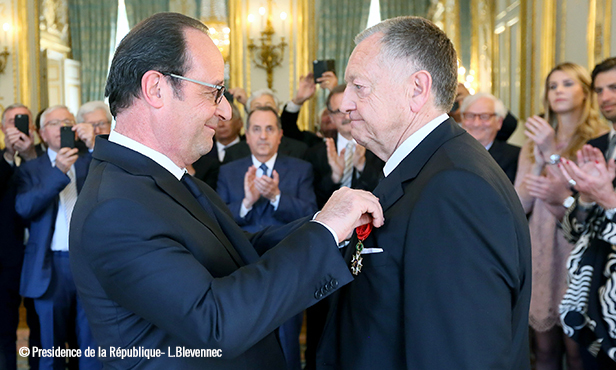 Meanwhile, Jean-Michel Aulas was named Knight of the Legion of Honour in 2006. Today, François Hollande promoted him to the rank of Officer of the Legion of Honour, in front of about 50 relatives who were able to attend this ceremony in the prestigious room of the Elysée. This new honour underlines Aulas’s remarkable entrepreneurial journey, as head of CEGID, which he found in 1983, and as president of Olympique Lyonnais, which he acquired in 1987.